The book on Johnston is being chaptered. I have started with his first ancestor in America Daniel Robinson. A special thanks to Johnston's relatives who have been working on the geneology. It was a surprise for them to find that Johnston was a part of the family. If you think you are related, please write in. I can tell you fairly quickly if you are and where you might be in the family tree. Some of the names are Baker, Garrison, Robbins, Robins, Stanaback, Tillman, and many more as offspring married and had more children. Johnston's brother died and had not married. His sisters all married and had children, but one. So there are branches in the New Jersey--Pennsylvania areas. There are living relatives that are now aware of Johnston being in their family tree. As for Johnston, rumor is he might have had children around the Billings area and maybe in the Crow tribe, however, the links have not been there to study. He never married and the summer he spent with one native woman seemed to be a working one. Research has found that Isaac, Johnston's father, had been married before and had children, but indications seem to be that there are no living relatives from that union. About: Plains Indians and other famous characters of the old west. John Johnston joined the 2nd Colorado Calvary, and, his brother joined the 1st New York Sharpshooters. Unfortunately his brother was killed in 1864. Johnston got out in September of 1865. Johnston served with the 2nd Colorado Calvary, Company H in the Missouri-Kansas theatre on Provost duty and guiding wagon trains. He was wounded and had constant eye trouble. Please contact us with any relatives that served in the 2nd. Brian is working on the photograhs of the graves of the men. Also a diary of SGT. Francis M. Gordon has been donated and should shed light on the daily work of the 2nd. 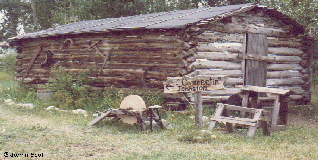 Try Trail Town in Cody, Wyoming, Johnston is now buried there.